It’s been another great year of baseball blogging here. Please be sure to blog your own 2015 year-end post and leave the URL here so we can show them all off. Then prepare for the 2015 MLB.com/blogs Top 100 Latest Leaders badges that we will be handing out soon. Is yours going to be on the list? Happy Holidays from us at Major League Baseball Advanced Media. On a hot day in August, I am waiting for October. And as I just wrote on MLB.com, I am waiting for a lot more than that as a Baseball fan. I am waiting for a Cubs parade, my loaded Hall of Fame ballot this December, another Dodger Dog and more. I hope you will read my own list, share that story and then blog about what YOU are waiting for as a fan. A title for your team? Of course. An autograph from your favorite player or legend? Sure. But you are waiting for more than that. It’s what makes you a fan, what makes you blog, what you love about the game. Please include your Permalink in comments here so we can find your own list! With the 2012 season now in the books, we’re going to be looking to continue this series. Stay tuned for details on how you can be the next MLB.com Blogger featured here. PHILADELPHIA — That was just an unbelievable scene, and there are so many things I will never forget about what happened here in Philly. More than anything, it was just talking to the fans. Even more than talking to the players. I have been doing this every day, and tonight it was to the point that I would just walk up to fans with my MLB.com cap and I didn’t even have to introduce myself — they would just start telling me their stories. Some were in tears. I am kind of braced for the celebration-streets news, but overall it was just a fabulous scene as a baseball fan. 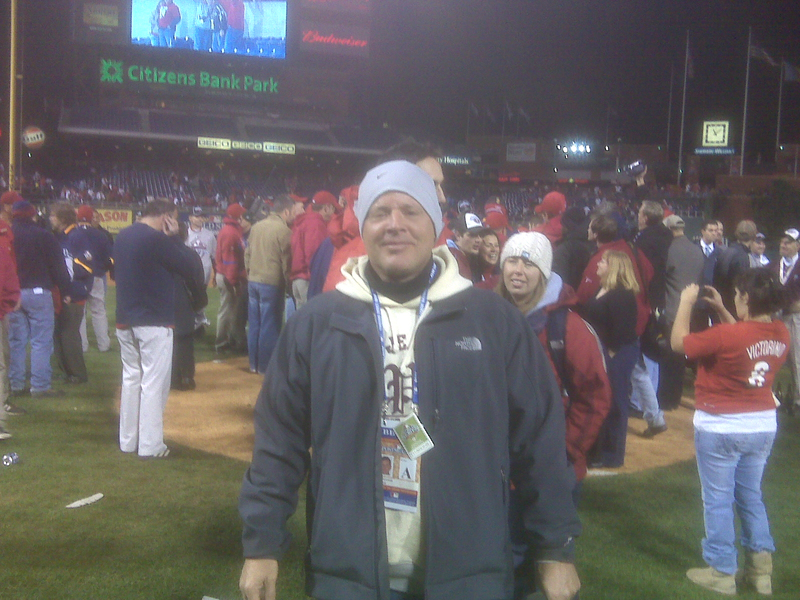 Here I am on the field as Jamie Moyer and grounds crew members behind me try to dig up the pitching rubber. It took forever to pry it up out of the packed clay. Then Jamie carried it around above his head like it was the Commissioner’s Trophy. It was his trophy. He earned it. He stepped on that pitching rubber how many times this year? Everyone celebrated in their own way. I just liked being out on the grass. I didn’t want to leave it. It has been a wild postseason. I started with the Cubs, and was instructed to stay with the Cubs as far as they go. They didn’t go far. Then I was with the Dodgers. Then it was off to the World Series, and the scene in St. Pete was a pure joy to experience for a change. Then this. What I love especially about our golden era in Major League Baseball is that we are spreading this around, spreading the love. Last year, the Rockies. There is always new excitement somewhere. It’s so different than the old days, when it was elite and even predictable. Most everyone is leaving. I am going to stay here through the parade, might even ride in it. I will head back to New York City Friday night, then go to the Expo on Saturday to pick up my registration/bib number, and then I run the New York City Marathon on Sunday morning. I was sweating bullets the last few days wondering if I’d just lost my marathon because of the weather, but even if we had gone back to Florida I was safe. Now I can rest a little bit for it and carbo-load. It is just an incredible week. Sorry for the infrequency of posting here, but we have been cranking out content on a constant basis at MLB.com and that rules all…and some marathon training mixed in to keep it going. I’ll be back with Latest Leaders this next week. OK, leave lots of comments and don’t forget to include your full URL so people can find their way to your blog. What do you have planned for the offseason? We plan to launch the NUMBER ONE HOT STOVE BLOG anywhere. Our Trade Talk blog shot to the top of all trade-deadline blogs on the Internet in terms of traffic, maintained by our 30 on-the-scene correspondents with each club. We’ll do the same for the whole offseason. You definitely will want to line that up on your blogroll and get the RSS feed; we’ll let you know when it’s live. I’ll be putting my MLB.com Gift Guru hat back on, and you will be sick of seeing me trumpet the wonders of the MLB.com Shop by the time the late December holidays hit. That’s me. Congratulations again to the Philadelphia Phillies. Champions of the world in 2008. Wow. I am quoting Patti LaBelle directly there from her unique rendition of the “Star Spangled Banner” before Game 4. Here, you can see the Skylight’s Last Gleaming and the rockets bursting in air as I used my Canon A540 to take the following video of the last pitch of Game 4 and the fireworks. Enjoy and keep on blogging! Drop by the blog and leave your comment! Game rises to occasion on memorable night is top headline on MLB.com now pointing to my (very late in the) nightly article about the races this final week. See if you agree. That was mind-blowing all night. I hope I gave you lots of blogging fodder there, and vice-versa, I always like to read MLBlogs and see everyone else’s perspectives. I can tell you that my own work schedule has just reached high-velocity insanity mode and will become only moreso when I head for Chicago next midweek. I’ll be with the Cubs as far as they go, and my life will be talking to Cubs fans and living and breathing their ongoing hope of glory. I will be writing this article again tonight well past midnight so feel free to drop a line and keep me company with any great thoughts about the day/night in baseball. I just have to say that I will never forget what it was like in late October of 2004. I lived in St. Louis then, and I remember seeing all the Red Sox fans taking over the town. Hearing them tell me their stories was remarkable. I remember that night of Game 4 talking to many of them inside old Busch Stadium, and even in the eighth inning, they would tell me they can’t jinx anything and won’t talk yet about what it would be like to win it all. If we get to that point in late October with the Cubs, the exact same thing will happen. Cub fans will shut up before they go wild, trust me. It was starting to get like that in the 2003 NLCS before the disaster…everyone was talking about what-if…and more and more thoughtful about it instead of braggadocio. If the Cubs are in the World Series, I predict that Cub fans will swallow their tongues for several days first, hold their breath like never before, fear a jinx they have never feared in their lifetimes (unless they were around for the 1945 World Series), and only exhale upon Derrek Lee or someone catching the final out. If the Cubs are eliminated early, I move on to wherever there is another wonderful story in October, maybe in Florida or Massachusetts or Los Angeles or Milwaukee…who knows. What do you think is going to happen next month? I can’t stop thinking about the possibilities.